As everyone probably saw yesterday, the Fall Acorn and Gourd keys are now available to buy, to compliment the crates that started dropping not long ago. But what’s in these crates and is it worth it? Well, the answer is always “no, it’s not worth it”, but oh well. There are 25 items available: Slick Cut, Frenchman’s Formals, Ward, Pop-eyes, Hong Kong Cone, Weight Room Warmer, Hurt Locher, Pirate Bandana, Li’l Snaggletooth, L’homme Burglerre, Escapist, Flapjack, A Brush with Death, Bone Dome, Air Raider, Viking Braider, Cuban Bristle Crisis, Beep Boy, Special Eyes, Trickster’s Turnout Gear, Chronomancer, Medical Mystery, Gold Digger, Brim-Full Of Bullets and Cotton Head. Out of all these, there are some gems. The Beep Boy seems to make noises, Ward looks amazing, Pirate Bandana completes Pirate Demoman, Li’l Snaggletooth is cute and jiggleboned and… OH MY GOD THOSE PYRO EYES! Unlike Engineer’s Special Eyes, Pop-eyes are bloody terrifying. While Sight for Sore Eyes and Gogol Eyes are both nice, Pop-eyes… Looks like a Halloween item to me. Anyhow, most of these items are very nice, and probably worth a few refined. But remember, these items always end up being craftable and droppable. Or just trade them for a refined or two, as most items end up cheap after the initial rush passes. Oh well. More hats. That brings us to 701 cosmetic items in TF2. Great. 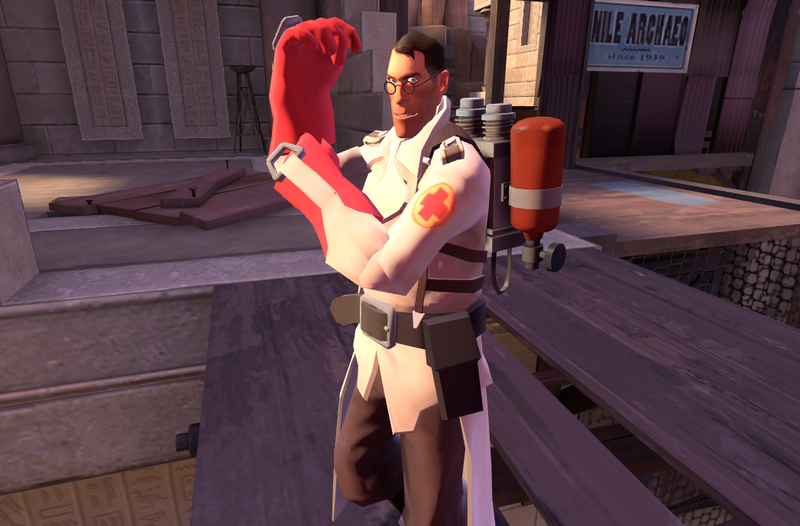 At least Medic got a few nice items. Soldier on the other hand didn’t do so well. I must say, I do look dashing! 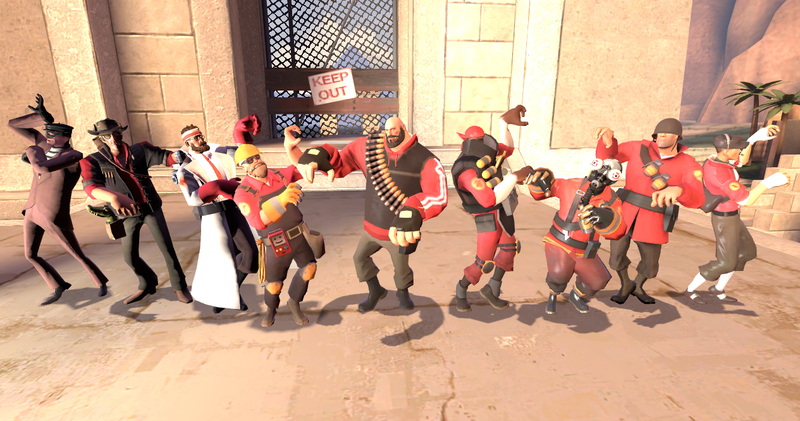 ← Pyro melees and you!